Centricity Patient Portal is a flexible and scalable patient portal designed to help medium-sized practices better engage patients and their families in their care. By extending the provider workflow to the patient's home with a range of easy-to-use, self-service tools, Centricity Patient Portal helps strengthens your market and competitive position, enhances patient communications, and optimizes staff and provider productivity. Convenient tools for efficient care coordination and secure patient communications that can help directly impact outcomes. Built-in workflow efficiencies that can optimize clinic traffic, help reduce redundancies and errors, and enable more effective staff deployment. A flexible, scalable and highly configurable user interface for integrating patient communications functionality into your existing website. 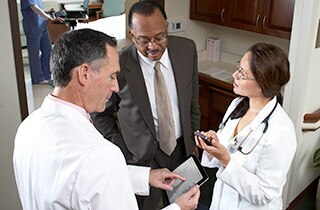 CentricityTM Patient Online promotes patient engagement while optimizing the workflow in busy practices. Centricity Group Management practice management software automates patient access, billing, collections & reporting for medium-size physician practices and billing services.